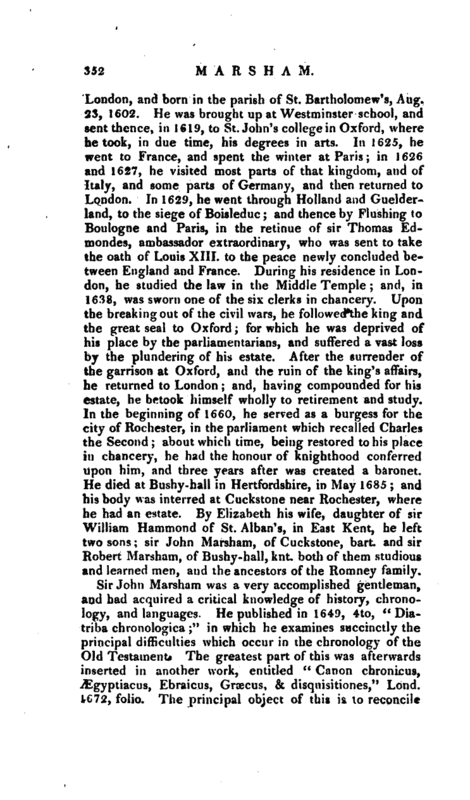 , a very learned English writer, was the second son of Thomas Marsham, esq. alderman of | London, and born in the parish of St. Bartholomew’s, Aug. 23, 1602. He was brought up at Westminster school, and sent thence, in 1619, to St. John’s college in Oxford, where betook, in due time, his degrees in arts. In 1625, he went to France, and spent the winter at Paris; in 1626 and 1627, he visited most parts of that kingdom, and of Italy, and some parts of Germany, and then returned to London. In 1629, he went through Holland and Guelderland, to the siege of Boisleduc; and thence by Flushing to Boulogne and Paris, in the retinue of sir Thomas Edmondes, ambassador extraordinary, who was sent to take the oath of Louis XIII. to the peace newly concluded between England and France. During his residence in London, he studied the law in the Middle Temple; and, in 1638, was sworn one of the six clerks in chancery. Upon the breaking out of the civil wars, he followed the king and the great seal to Oxford for which he was deprived of his place by the parliamentarians, and suffered a vast loss by the plundering of his estate. After the surrender of the garrison at Oxford, and the ruin of the king’s affairs, he returned to London; and, having compounded for his estate, he betook himself wholly to retirement and study. In the beginning of 1660, he served as a burgess for the city of Rochester, in the parliament which recalled Charles the Second; about which time, being restored to his place in chancery, he had the honour of knighthood conferred upon him, and three years after was created a baronet. He died at Bushy-hall in Hertfordshire, in May 1685; and his body was interred at Cuckstone near Rochester, where he had an estate. By Elizabeth his wife, daughter of sir William Hammond of St. Alban’s, in East Kent, he left two sons; sir John Marsham, of Cuckstone, bart. and sir Robert Marsham, of Bushy-hall, knt. both of them studious and learned men, and the ancestors of the Romney family. Sir John Marsham was a very accomplished gentleman, and had acquired a critical knowledge of history, chronology, and languages. He published in 1649, 4to, “Diatriba chronologica;” in which he examines succinctly the principal difficulties which occur in the chronology of the Old Testament.“The greatest part of this was afterwards inserted in another work, entitled” Canon chronicus, Ægyptiacus, Ebraicus, Groecus, & disquisitiones,“Lond. 1672, folio. The principal object of this is to reconcile | the Egyptian dynasties. The Egyptians, as is well known, pretended to excessive antiquity, and had framed a list of thirty successive dynasties, which amounted to a number of years (36,525) greatly exceeding the age of the world. These were rejected as fabulous by some of the ablest chronologers; but sir John Marsham first conjectured that these dynasties were not successive, but collateral; and therefore without rejecting any, he endeavoured to reconcile the entire series in this manner, to the scripture chronology. The attempt, which was highly ingenious, gained him great reputation, and many contemporary as well as succeeding authors, have been liberal in their praises. Mr. Wotton represents him as the first” who has made the Egyptian antiquities intelligible: that most learned gentleman,“says he,” has reduced the wild heap of Egyptian dynasties into as narrow a compass as the history of Moses according to the Hebrew account, by the help of a table of the Theban kings, which he found under Eratosthenes’s name in the Chronography of Syncellus. For, by that table, he, 1. Distinguished the fabulous and mystical part of the Egyptian history, from that which seems to look like matter of fact. 2. He reduced the dynasties into collateral families, reigning at the same time in several parts of the country; which, as some learned men saw before, was the only way to make those antiquities consistent with themselves, which, till then, were confused and incoherent.“Dr. 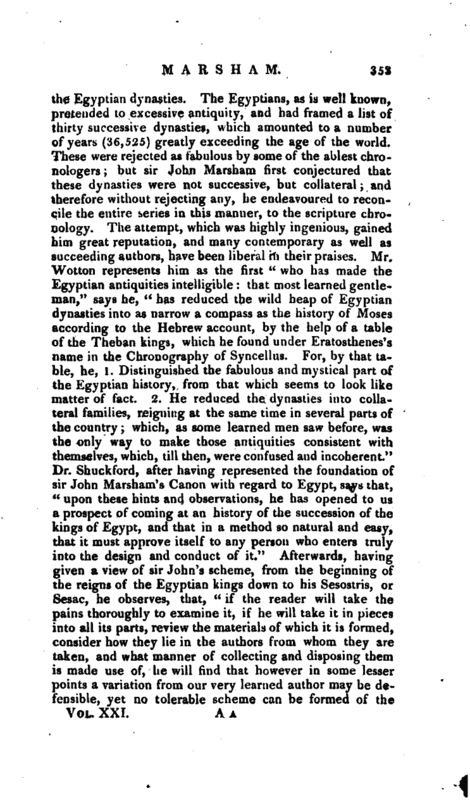 Shuckford, after having represented the foundation of sir John Marsham’s Canon with regard to Egypt, says that,” upon these hints and observations, he has opened to us a prospect of coming at an history of the succession of the kings of Egypt, and that in a method so natural and easy, that it must approve itself to any person who enters truly into the design and conduct of it.“Afterwards, having given a view of sir John’s scheme, from the beginning of the reigns of the Egyptian kings down to his Sesostris, or Sesac, he observes, that,” if the reader will take the pains thoroughly to examine it, if he will take it in pieces into all its parts, review the materials of which it is formed, consider how they He in the authors from whom they are taken, and what manner of collecting and disposing them is made use of, he will find that however in some lesser points a variation from our very learned author may be defensible, yet no tolerable scheme can be formed of the | ancient Egyptian history, that is not in the main agreeing with him. 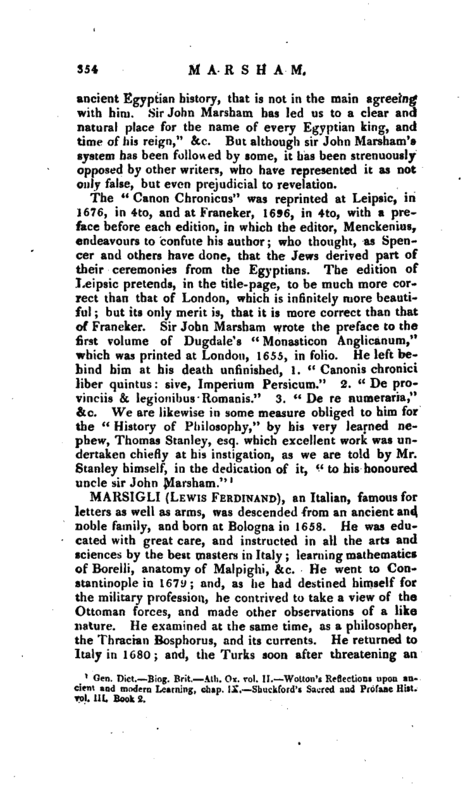 Sir John Marsham has led us to a clear and natural place for the name of every Egyptian king, and time of his reign," &c. But although sir John Marsham’s system has been followed by some, it has been strenuously opposed by other writers, who have represented it as not only false, but even prejudicial to revelation. Gen. Dict. Biog. Brit. —Ath. Ox. vol. II. 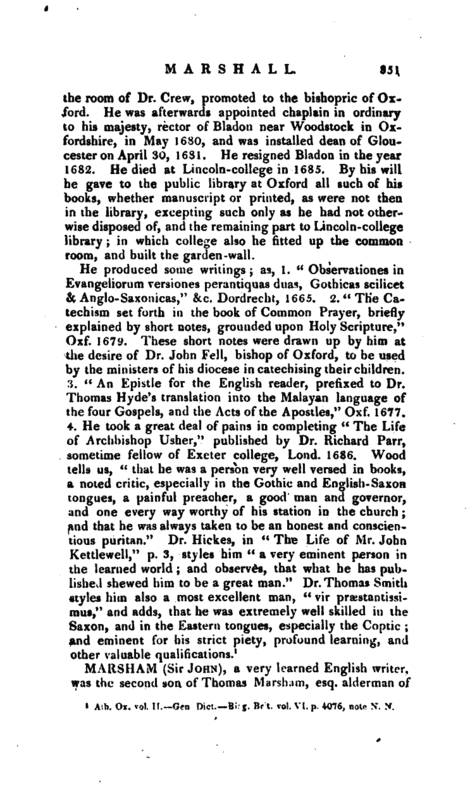 Wotton’s Reflections upon ancient and modern Learning, chap. IX, Shuckford’s Saered and Profane Hist, vol. III. Book 2.